I loved learning about how Kathy came up with the setting for Caper Magic and I also love how this is going to be a series. Cape Vincent sounds amazing and I can see why it gave her the inspiration to write this story. It must be super intriguing. The cover looks awesome! Congrats Kathy and I wish you the best of luck! so terribly sorry for the delay in replying. My computer died. Then the backup died. Then my M-I-L died. This is not a good month!! anyway, Cape Vincent is enchanting and it's been great fun tweaking it for this story and ones to come. Sounds like it should be a fun series! Great interview, ladies! this is one of those books of the heart which had to be told--or the characters would haunt me in my dreams. What an interesting and diverse employment history, Kathy. Many great books should come from all that experience. Good luck and great sales for Caper Magic. yep. as we say in the [retired] nursing game: been there, done that. Great interview, ladies. Kathy, I like your selection of Anthony to play Nick. Best of luck with this story, and with the series. OMG Anthony Denison. If I could, I'd take his Closer/Major Crimes character and hook him up iwth a ballsy ER nurse. A match made in heaven--or hades!! I like historically romantic settings myself. thanks for sharing. this town is so quaint, with historic landmark signs all over the place as well as historic references. For example, the building which houses the library sits on the site of a home purchased for Napoleon by one of his sibs in hopes he'd relocate there after his release from Elba. Never happened but the French influence in the area is quite strong. I haven't read very many serial stories, but I've got an addictive enough personality, I'm betting I'd get sucked in. Very cool. my current WIP is a sequel from a novella in the Class of '85 series out of TWRP. The new chief of police [significant other to one of the Caper Magic characters] is taken hostage with two 80 year-old twins nicknamed Murder and Mayhem by the locals whom he previously cited for playing bumper cars in the local Walmart as they fought over the last bottle of Metamucil. "Caper Magic" sounds intriguing. I like how you discovered your setting. Thanks for leaving Kathy a comment, Judy! This sounds like an intriguing series, Kathy. I love the idea of an underground railway. Best of luck! thanks for stopping by. Hope all is well with you and your writing. I have to admit, I didn't see the sliver of girl off to the right in that photo, so I thought there was a creepy disembodied hand attached to Kathy's shoulder. that picture was taken almost 30 years ago and remains one of the best of myself. The hand belongs to one of my kids. We were probably celebrating a First Holy Communion or Confirmation. Hah!! Love your cover and your concept. I'm glad to see the Magdalene laundries getting "aired" in a book. That should add huge motivation to your heroine! Best wishes with your release. yep. I didn't have a lot of time to explore the Magdalenes in this story but I plan to with future works. The scandals just keep on coming out of the woodwork, don't they? Like termites or rats. Interesting blog-interview and I learned a lot about YOU. Good luck with your newest work--sounds perfect for a series. I'm glad you enjoyed the interview, Susan! thanks so much for stopping by. I'm like an onion. Many layers which come off when I least expect it. looking forward to your next visit to my blog!! Nothing like the beginning of a new series. I look forward to reading it and discovering Cape Brendan. thank you so much for inviting me to your blog. This was great fun--and so many diverse comments! 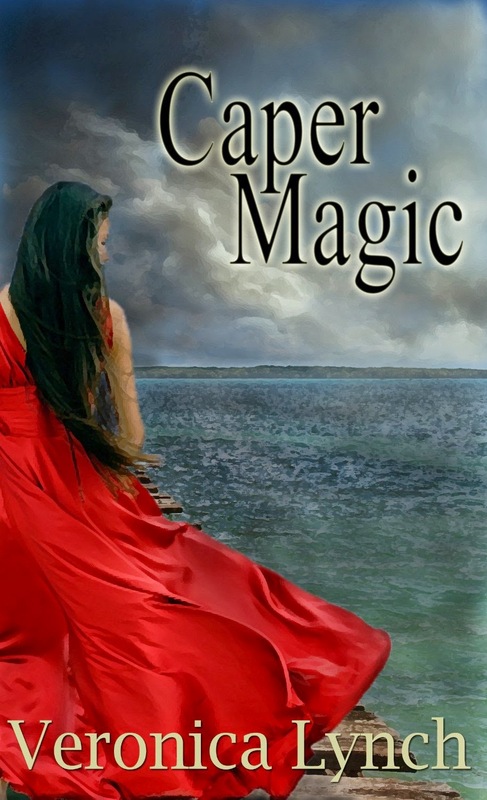 the cover for Caper Magic took my breath away. It was done by RJ Morris who, besides being one of the movers and shakers at Wild Rose Press, is a very talented artist and also a talented seamstress. She does a lot of work creating period costumes. I never met Veronica Lynch but when my father spoke her in a particular tone of voice that men of Irish Catholic heritage use when speaking of women they admire and respect, I figured she was someone to emulate. Interesting interview and I love the cover and description. I also like the sound of the setting. thanks for the compliment. I love the setting in real life, and the one I made it into. LOVE that red dress on the cover. Very striking. And it makes me wish I was on the water! Awesome cover indeed, your posts all just showed up on my blog roll, weird. HAHA! That's because something happened to my blog feed and I had to resync it and do a bunch of other stuff on Feedburner to get it working again. Glad to know it works now!